Julianne (Nardine) Richardville, 89, of Franklin, IN, formerly of Vincennes, IN, passed away Monday, December 18, 2017 at the Otterbein Franklin SeniorLife Community in Franklin, Indiana surrounded by her family. She was born September 5, 1928 in Vincennes, IN to the late Alfred T. Nardine and Mary (Owens) Nardine. She married Theodore J. Richardville on May 2, 1953 at Old Cathedral Catholic Church in Vincennes, IN, they were married 59 years. He preceded her in death on July 9, 2012. Julianne graduated from St. Rose Academy in Vincennes with high academic honors and attended Washington University in St. Louis, MO. She owned and operated, alongside her late husband Theodore, Progress Laundry and Dry Cleaning in Vincennes for over 50 years. 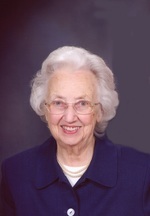 She was a member lifelong member of Old Cathedral Basilica St. Francis Xavier Catholic Church in Vincennes, Psi Iota Xi Sorority, and Fort Nightly Club. She had a great passion for music, theater, playing the piano, singing, cooking, fishing at their cabin, watching movies and her dog Buddy. Survivors include her children Theodore “Ted” Richardville (Debra) of Rosemount, Minnesota, Patrick J. Richardville (Rene’e) of Bruceville, IN., Eugene J. Richardville (Rebecca) of Evansville, IN., Mary L. Richardville Swartz (Scott) of Franklin, IN., and Julianne Richardville Baehl (friend Dave Zentheofer) of Fort Branch, IN; grandchildren Patrick Richardville, Jennifer Richardville, Jason Richardville (Finace’ Rebecca Atterberry), Rachel Richardville, Shawn Yochum (Melissa), Ashley Jones (Ryan), Emily Greemore (John), Alex Baehl, Evan Baehl all of Fort Branch, IN, Megan Richardville (fiancé Connor Lentz), Morgan Richardville (friend Justin), Luke Richardville (Stephanie), and Samuel Richardville; great-grandchildren Theodore “Theo” Richardville, Evangeline Marie Richardville, Christopher Jones, Jacob Greemore, Hayden Grace Yochum, and August Yochum; brother Alfred Nardine (Janice) of Vincennes; her sister Mary Gladys Wheeler of Vincennes, IN; and several nieces and nephews. She was preceded in death by her parents; husband; an infant son; and a sister Charlotte McCarthy. Father David Fleck will conduct a Mass of Christian Burial on Friday, December 22, 2017 at 12 Noon at St. Francis Xavier Old Cathedral Catholic Church, 205 Church Street, in Vincennes, Indiana where friends may call from 10AM till service time Friday. Additional visitation will also take place on Thursday, December 21, 2017 from 4-7PM at Swartz Family Community Mortuary and Memorial Center, 300 South U.S. 31 (Morton Street) in Franklin, IN where Father Steve Schaftlein will conduct a rosary service at 4PM at the mortuary. Burial will be in Mt. Calvary Catholic Cemetery in Vincennes, IN. Memorial contributions may be made to the Knox County Humane Society, 405 Main Street, Vincennes, IN, 47591 or Southern Care Hospice Services, 6620 Parkdale Place, Suite N, Indianapolis, Indiana 46254. Fredrick and Son McClure Utt Funeral Home, Vincennes Chapel is assisting with services. Online condolences may be sent to the family at www.swartzmortuary.com. Information at 317-738-0202.